The Prevent 400 pressure relief hospital mattress is a perfect choice for the high risk bedsore patient that spends more time in bed. The top layer of foam is Lura-Quilt™which is a patented aerated open cell foam that allows air to continuously circulate under the patient to keep them cool and dry. This hospital mattress contains 4 layers of pressure reducing foam. Multiple layers of foam prevent issues such as cell break down or bottoming out. 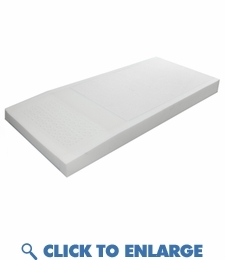 The special layered foam design offers a sleep surface designed to relieve painful pressure contact points. It is engineered to keep the patient cool preventing heat buildup on the skin. The heel area slopes from 6" to 4" in the lower foot section of the mattress. This slope offsets pressure in the heels protecting the feet from skin breakdown and abrasions. It includes a 4 way stretch cover that is designed to prevent shearing of the skin. It is easy to clean, waterproof, removable, and washable. Multi-tiered pressure redistribution mattress with top layer of patented Lura-Quilt™ foam is aerated which allows air to continuously circulate reducing heat buildup, perspiration, and skin maceration.